"In history, there have been numerous instances of extremely long-lived beings ruling over mortal humans. Elves, undead, even creatures from different planes of existence - they all have gained dominion over one group of humans or another. But few of them lasted to present times. But one such society that still exists now and shows no signs of fraying is that of the draconic rulers of the cities of the Desert of Thunder. An examination of how this extended family of dragons has maintained its power for so long makes for a fascinating case study…"
The Desert of Thunder is one of the driest regions on the face of Rothea. Yet large cities thrive there, thanks to gates to the elemental planes of water that keep the cities fertile. Each city is ruled by a member of an extended family of blue-scaled dragons, whose laws are harsh, but usually fair. While the use of nexus towers was largely abandoned throughout much of the former Atalan Empire during the Feudal Age, the dragons never forgot how to build and use them. They constantly refined their structures and improved their output so that their efficiency was unparalleled until the Flannish nexus towers of modern times. Thus, the Desert of Thunder has long been a major producer of magic items and other arcane goods - as a large number of arcane specialists are required to run the towers, the percentage of wizards in the general population is very high. Though the dragons reserve much of the created magic for themselves, many items still remain available for trade and export. Furthermore, the unique nature of the desert city-states has lead to a higher rate of urbanization than almost anywhere else in the world. This abundance of laborers within the cities has created a large number of skilled artisans and craftsmen whose creations find ready customers elsewhere. Their means of production may not be as efficient and advanced as those of the factories of the Flannish Cities, but since most of their immediate trade partners are very advanced either, this has not been a major problem so far. The sole exception are the dwarves of Gol Murak, whose metalwork was widely respected and sought after - but thanks to their recent troubles, even they have to import finished goods from the Desert of Thunder. Some cities also sell some specialized raw materials, most notably marble. A major problem in large-scale trade has been the harshness of the desert climate the overland caravans have to deal with. 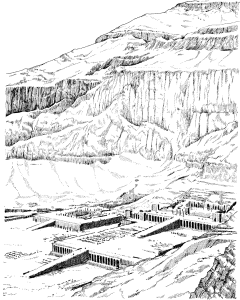 There have been some attempts of creating a local rail network between the cities, but the shifting sands of the desert made such ventures extremely difficult. Right now, most such efforts are concentrated on the Grand Road, since the planned subterranean rail system would have no such problems. On top of the social hierarchy are undoubtedly the dragons. They are the ruler and tyrants of the cities, and their word is law. But without their magics, the cities and the inhabitants could not support themselves in the parched desert, and thus most humans accept their rule. The dragons are matriarchal - the most powerful female of their family has ruled them, and it is the females who are responsible for raising the young and instilling the knowledge and values into them necessary for thriving in this society. But each dragon is a ruler of a city in its own right, and any dragon, male or female, can rise in the esteem of its peers by ruling a large and prosperous city - which means that it will get rich from the taxes and tariffs levied on the community. The male dragons also compete at formal challenges and battles for mating rights - the females choose the dragons with the most impressive displays as suitable mates for their next clutch of eggs. Other than that, the males do not get involved with rearing the children in any way. Some dragons also create new dragonkin as their favorite servants. While dragonkin are no longer held as high in regard as they first were when created by Thurangax - and there is a fair amount of mistrust between many dragonkin and the dragons - newly created dragonkin still tend to be fiercely loyal to their creators in exchange for this "blessing". Humans and similar races fill out the rest of the social spectrum, from rich merchant families to the lowliest slaves. The latter are bought from other regions or captured by slavers, but while their fate is usually harsh, the dragons have decreed that the children of slaves should be free. This helps prevent slave rebellions, as the slaves know that at least their children have a chance of a better life - and might even be able to buy them free in return. One important law bears mentioning: After centuries of problems with surathi infiltrators, the dragons have decreed that all children born with obvious birth defects (a possible sign of surathi ancestry) should be instantly slain, along with their mothers - and that the mother's brothers should be castrated immediately afterwards. As a result, the men of this society often take extreme measures to make sure that their female relatives remain virgins until marriage so that they don't bear the offspring of a surat. If a human female is found not to be a virgin during the wedding night, the prospective husband will reject her - and the male relatives will often slay her and anyone whom they suspect of violating her. As long as their faiths do not attempt to undermine the authority of the dragon rulers, the people of the Desert of Thunder are generally free to worship whatever deity they want. One of the most popular gods is Hatramo, as most citizens are all too aware that all they do is only at the sufferance of their rulers, and that all they have worked hard for might be revoked through unfathomable draconic whim. Bucatar also has a large number of followers, as the harsh desert outside of the city reminds everyone that it requires constant work to make the wilderness habitable. Kortus finds widespread acceptance as a god of death and acceptance of the same, and many people hope for rewards in the next life instead of aspiring to more in this one. Small communities of Thenos worshipers who stay together for mutual support can be found throughout the cities, and many merchants and other people with ambitions minds follow Argannon or Sarush in order to gain power over their rivals. About 2,300 years ago, the Desert of Thunder was a savanna settled by bands of mostly human nomads who survived by tending to herds of goats, cattle, and other domestic animals. A few dragons lived in the region who raided the nomads and frequently left dead tribes in their wake. Occasionally, a group of human heroes managed to slay one of the dragons, but not enough to make a dent in their population. At this point, a young dragon named Thurangax hit on a strange new idea: She approached several nomadic tribes, and suggested that as long as they give her an annual tithe of animals, she would not only spare them but also protect them from hostile tribes and other dragons. The tribes agreed, and both sides profited from the agreement - Thurangax became strong and powerful from the bountiful food, and both the herds and the humans multiplied. Time passed. Thurangax had many children, which adopted the same pattern, each protecting a few tribes of their own, and even cooperating versus dragons who preyed on "their" tribes. Eventually the humans formed permanent settlements, and the tribute expanded to include coins and jewelry - something which pleased the dragons immensely. Then, more than a thousand years later, the climate changed and the savanna began to dry up. The herds could no longer support themselves, and many humans either starved or fled to more fertile regions. "Fortunately" for the dragons, around this time the Atalan Empire started to expand into the region, causing many of the younger dragons to fly off to clash with its armies in search of plunder and glory. Many of them were killed by the Empire's mighty magics, but this was just as well, for the savanna - now turning into the Desert of Thunder - could no longer support their number. Thurangax, now ancient and powerful, studied the reports about the Atalan Empire carefully, and was intrigued by the potential of the nexus towers. For several years, she took on human form and traveled across the Empire, spying on its most sensitive installations, until she finally understood their construction and use. She then returned to the desert and built her own nexus tower, using the harnessed magical energies of a nearby community to create vast quantities of water. Her offspring followed suit, and soon cities sprang up everywhere in the desert, supported by nexus towers and dragon magics. Most humans hailed the dragons as saviors, and despite the harsh laws and regular tithes willingly lived under their rule. The population of both humans and dragons continued to boom to this day, with young dragons periodically gathering a group of followers and moving to a new spot of the desert to found a new community. Thurangax then set out to create a new race of servitors from her most promising human servants, and with the help of the nexus towers, the dragonkin came into being. Other dragons quickly followed suit, and soon the dragonkin became the aristocracy of the realm - ruling the day-to-day affairs of the cities for their draconic creators and defending their borders. The dragon cities became ever more powerful thanks to their new armies of dragonkin - so much that some dragons began to demand tribute from the governors of neighboring Atalan provinces for not invading their territory. Wars with the Atalan Empire became frequent, and contributed significantly to the decline of the Empire. But out of the blue Thurangax started a genocidal war against the dragonkin, the very beings she had once created as her servants. 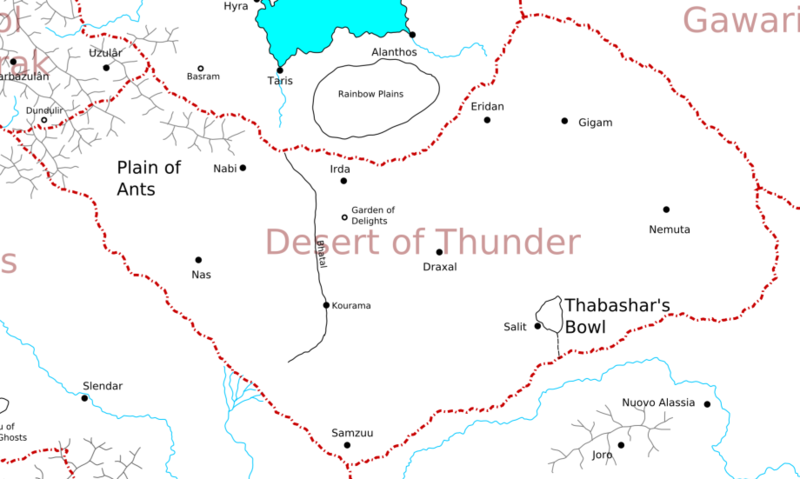 This drove most surviving dragonkin to other regions, and though she died ten years later and her genocide was stopped by her successor, the power of the Desert of Thunder was so weakened that they abandoned any aggression against the Atalan Empire - which was quickly coming apart by its own by now. Still, even the dragons of this clan remain highly territorial creatures, and despite the cooperation enforced by Tallaggarul, the current matriarch of the dragons, fights between neighboring dragons increase as the population density of dragons reaches its limits. While the dragons could just try to carve out new realms in distant parts of the world (and in fact, some try to do so), the humans elsewhere are much more hostile to dragon rule, and the more friendly climates make the people there much less dependent on dragon rule, decreasing their loyalty even further. Because of this, Tallanggarul, acting on reports from distant lands, has recently decreed that all new dragon settlements should not be founded in the Desert of Thunder, but on other planets. What the mere humans of Bodenwald can do, the dragons can undoubtedly do as well, and according to the reports she has received, the other worlds are hostile and remote enough to be ideal for the symbiotic relationship between dragons and humans that has developed in her realm. In her mind, there is no reason why all the planets shouldn't be under dragon rule one day. Dragons are among the most powerful monsters in D&D, and I wanted to create a region that really pays them tribute. The idea of dragons as rulers of cities within a vast desert was loosely inspired by the sorcerer-kings of the old Dark Sun setting, but I tried to develop the concept into something unique. That this region later allowed me to explain the origin of the dragonborn (now renamed dragonkin) when that race was introduced in D&D 4E was merely an unexpected bonus. The architecture of the region should be similar to that of old Mesopotamia, especially Babylon - huge, towering ziggurats all over the place.